The beginning of the end is almost here. The last College World Series that will ever be played at Rosenblatt Stadium starts Saturday. Below are statistical breakdowns of this year’s eight CWS teams as well as a “by the numbers” look at each team and analysis. Once the CWS begins Collegebaseball360.com will have daily coverage of every game in Omaha, including post game video with players and coaches, a daily blog and a daily CWS scoreboard. 1…College World Series appearance by the Horned Frogs. It’s also the first CWS appearance by any Mountain West Conference team in the 11 year history of the league. 51…Wins this season-a school record. 37-3…Combined record of TCU starting pitchers Matt Purke, Kyle Winkler and Steven Maxwell. The trio has also combined for 312 strikeouts and just 95 walks in 317 2/3 IP. 23-0…TCU’s record this season when its pitching staff strikes out at least 10 batters in a game. 14…Wins with no losses by Purke. The freshman was also the 14th overall pick in the first round by the Texas Rangers in the 2009 MLB draft, but he chose to go to college instead. 5-1…The Horned Frogs’ record so far in the NCAA post season. Their only loss was vs. Texas in game two of their Super Regional. .340…Team batting average, which is 10th best in the nation this season. 3.46…Team ERA-good for a #7 national ranking. TCU is the only team in the nation to rank in the top 10 in both team batting average and ERA. .558…Team slugging percentage-the best of any of the eight CWS teams and good for a #6 NCAA ranking. 1…TCU player, Matt Curry, who has double-digit home runs and stolen bases. Curry leads the Horned Frogs with 17 and 12, respectively. Curry also has team highs with 26 doubles and an 1.173 OPS. .373 & 66…Team best batting average and RBIs by outfielder Jason Coats, who has also hit 13 HR. ANALYSIS: TCU has the best combination of pitching and hitting of the eight teams in Omaha. Any questions about the Horned Frogs offensive and pitching stats against Mountain West Conference competition have already been answered. They took two of three from one of the nation’s best offensive teams, New Mexico, during the regular season. They also beat the nation’s best pitching team, Texas, in last week’s Super Regional. The biggest question would appear to be whether they can avoid the awe factor of the program’s first CWS appearance. 20…College World Series appearances by the FSU-the fifth most all-time appearances by a school. 2,570…Florida State baseball games head coach Mike Martin has been involved in as a player, assistant and head coach. Martin has been involved in nearly 75% of the 2,526 wins in the history of Florida State baseball. 15 & 68…Team leading home runs and RBIs by Mike McGee, who is also batting .328. 12…Team leading saves by McGee, which is tied for 10th in the nation. The junior, who doubles as the team’s closer, is 4-0 on the mound with a 1.37 ERA. 0…Complete games by the FSU pitching staff. The Seminoles join Arizona State as the only two CWS pitching staffs without a CG this season. 15…Out of 15 FSU pitchers who have made at least one relief appearance during the season. 255…Walks issued by the Seminole staff-the most of any of the teams in Omaha. 30…Team best stolen bases by Tyler Holt, who is also batting a team best .352 and leads the ‘Noles with 82 runs scored. ANALYSIS: As usual, Mike Martin’s Seminoles have a team that can hit, but there are questions with their pitching depth. Sean Gilmartin was knocked-out early in FSU’s Super Regional opener against Vanderbilt and then had to come back out of the bullpen to help win game three. A win over TCU and freshman ace Matt Purke in the opener would be huge. 3…College World Series appearances by the Bruins. This is their first since 1997. 48…School record wins this season. #6…National seed of the Bruins, which are one of just three national seeds to make it to Omaha. 22…School record wins to open the season by UCLA. The Bruins first setback was an 8-4 loss to Stanford on April 3rd. 2.94 & .218…Team ERA and opponent batting average of the Bruin pitching staff. The ERA is the second best in the nation (behind Texas). 639…NCAA leading strikeouts fired by the UCLA pitching staff. 396…Of the strikeouts that have been recorded by weekend starters Gerrit Cole, Trevor Bauer and Rob Rasmussen. The trio is also a combined 31-8 this season. 11…Wins this season by Rasmussen. The junior has the most wins by a Bruin hurler since Jim Parque set the school record with 13 on the team’s 1997 CWS team. 1…Career complete game Rasmussen has tossed. It came in Sunday’s Super Regional clincher vs. Cal State Fullerton. .464 & .401…Team slugging percentage and on-base percentage. The slugging percentage is the lowest in the CWS field, while the on-base percentage is tied for the second lowest with Oklahoma. 0…Double digit home run hitters for UCLA. They’re the only such CWS team this year. .328-7-45…Batting average, HR and RBIs by Tyler Rahmatulla, who started 61 of UCLA’s 62 games this season as their primary 3-hole hitter. The sophomore will miss the CWS after breaking his wrist in the Bruins’ Super Regional celebration dog pile. ANALYSIS: As evidenced by the strikeout total UCLA is built on not just pitching, but power arms and that’s what usually gets it done in the post season (although not for Texas last week). The Bruin pitchers aren’t just strong-armed, they’re confident as well. UCLA must overcome the loss of Rahmatulla, who emerged early as one of their top run producers. A team that doesn’t have a lot of offense to begin with can’t afford to lose what offense it has. 6…College World Series appearances by the Gators. This is their first trip to Omaha since finishing as the national runner-up in 2005. 3…Years as a head coach by Gator boss Kevin O’Sullivan. 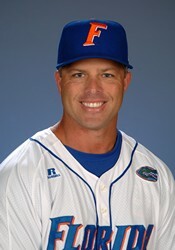 He made trips to the CWS as a Clemson assistant in 2000, 2002 and 2006. 3…National seed of the Gators, making the first round Florida vs. UCLA game the only one to feature two national seeds. 6.9…Runs a game scored by Florida-the lowest of the eight teams in the field in Omaha. .381…On-base percentage by the Gators-the lowest of the eight CWS competitors. 1…Complete game this season by the Florida pitching staff. Alex Panteliodis got it last week when he struck out 12 in Florida’s 7-2 win over Miami in the Super Regional opener. 11…Saves by Kevin Chapman, who has made a staff high 30 appearances while holding opposing batters to a .183 average. 6…Florida position players who have started at least 25 games who are either freshmen or sophomores. 2…Freshmen, Brian Johnson (6-4) and Hudson Randall (8-3), who join the sophomore Panteliodis (11-2) in the weekend pitching rotation. 3.97 & .413…Johnson’s ERA and batting average this season. The freshman has started 14 times on the mound as well as 26 games in the Gator line-up. 17 & 70…Team leading home runs and RBIs by freshman Austin Maddox, who has started 61 of his team’s 62 games this season. .358 & 23…Team high batting average and stolen bases by Matt den Dekker, who is one of a handful of seniors on the team. He has also hit 13 home runs and has scored a team best 64 runs. .978…Team fielding percentage-the best of the eight CWS teams and 6th best in the nation. ANALYSIS: The Gators don’t do anything particularly flashy, they are just good across the board and they find a way to win. They’re battled tested with big SEC series wins, including the regular season finale vs. fellow CWS team South Carolina. There’s a possible Omaha awe factor as well for the young Gators. The Dugout in Omaha has everything you’re looking for when it comes to officially licensed CWS hats and shirts! #1…National seed. The Sun Devils are one of just three national seed (along with UCLA and Florida) to make it to Omaha this year. 24…Consecutive wins by ASU to open the season. They suffered their first loss on April 2nd with a 6-5 setback to Oregon in 12 innings. 134…Stolen bases by the Sun Devils-the most of any CWS team. Drew Maggi leads ASU with 35 swipes. 14…NCAA leading triples hit by Pac 10 Player of the Year Zack MacPhee, who also leads the Sun Devils with a .679 slugging percentage. MacPhee’s .394 batting average is second only to Riccio Torrez’s .399 avg. 33-3…Combined record of starting pitchers Merrill Kelly, Jake Borup and Pac 10 Pitcher of the Year Seth Blair. 7-2…The trios ASU record last year, with all the decisions courtesy of Blair. Kelly is in his first year at ASU after transferring from Yavapai CC, while Borup made just eight appearances last year as a freshman. 0…Innings pitched this year by Josh Spence due to an elbow injury. Spence was 10-1 with a 2.37 ERA for last year’s CWS team. He was drafted in the third round of last year’s MLB draft by the Angels, but chose to return to ASU for his senior season. 0…Complete games by the ASU pitching staff. They join Florida State as the only two staffs in Omaha without a CG this year. 23…Saves by Sun Devil pitchers-the most of any CWS team this season. Jordan Swaggerty leads the way with 14, which is tied for the third most in the nation. .239…Opponent batting average by the Sun Devil staff. The mark is second only to UCLA’s CWS leading .219. ANALYSIS: Arizona State brought plenty of confident teams to Omaha under former head coach Pat Murphy, but never brought home the big prize. Under Tim Esmay the Sun Devils enter the CWS this year in circumstances similar to last year’s Cal State Fullerton team that was 5-0 in Regionals and Super Regionals, but went 0-2 in Omaha. ASU still has the same swagger under Esmay as they head under Murphy, but can they finally go the distance with it? 12…College World Series appearances by Clemson – the 11th most all-time appearances by a team. 43…Wins by the Tigers – the fewest of the eight CWS teams. 23…Clemson losses – the most of the field in Omaha. 20 & 20…Touchdown passes thrown and home runs hit by quarterback/outfielder Kyle Parker, who is the first such 20/20 two-sport athlete in Division One history. The Colorado Rockies took Parker with the 26th pick in the first round of this year’s MLB draft. 4.72…Team ERA – the highest of this year’s CWS teams. .280…Opponent batting average, which is also the highest of the eight pitching staffs in Omaha. 8.8…Runs a game scored by the Tigers, making them the highest scoring offense in Omaha this year. 17 & 23…Home runs hit and stolen bases by 3B John Hinson, who is also batting .345 with 72 RBIs. 15 & 85…Home runs and RBIs by OF Jeff Schaus, whose RBI total ranks fifth in the nation and is the most of any player at the College World Series. 7-2…Alex Frederick’s record on the mound. The reliever has made just one start with a team high 30 appearances and is tied with starter Casey Harman (7-3) for the second most wins on the Tiger staff. 1…Complete game (tossed by Harman) by the Clemson pitching staff. 5…Tigers relievers, incuding Frederick, who have made at least 20 appearances this season. Harman and Scott Weismann (8-2) have each made 17 starts and are the only Clemson pitchers without a relief appearance in 2010. ANALYSIS: The Tigers hit and then hit some more, as evidenced by their 31 runs in their three Super Regional games vs. Alabama. They scored at least 10 runs in a game 25 times this season, but how will they fair in their first round match-up against an Arizona State team that pitches, hits and plays defense? ASU is going to put it in play and Clemson’s defense also ranks just 135th in the nation. 10…College World Series appearances by the Sooners, who haven’t been to Omaha since 1995. OU won the 1994 National Championship. 100…Home runs hit this season by Oklahoma – the most by any of the eight CWS teams and good for eighth in the nation. 65…Sac bunts by the Sooners, which is also the most by any of the eight CWS teams and good for seventh in the nation. 4…Home runs hit in OU’s two Super Regional wins over Virginia by Cody Reine. The OF was 5-for-8 with 11 RBIs in the game two and three victories. Five of his 10 HR this year have come in NCAA play. 95…Stolen bases by Oklahoma. With five more swipes OU would join Coastal Carolina and Miami as the only three teams with at least 100 HR and 100 SB this season. 2…Straight wins by Oklahoma to close their Super Regional series after losing 3-2 to Virginia in the opener. The Cavaliers hadn’t lost back to back games all season. 0…Runs allowed by the Sooners in their 11-0 Super Regional clinching win over UVA. It’s their first shutout in NCAA play since 1992. .371/16/64…Team best batting average, home runs and RBIs by Garrett Buechelle. The sophomore is the son of 11-year MLB veteran Steve Buechelle. .311/15/52…Batting average, home runs and RBIs by Cameron Seitzer. The sophomore is the son of 12-year MLB veteran Kevin Seitzer. .976…Team fielding percentage – tied with Arizona State for the second best fielding rate at the CWS. 5-0…Record of pitcher Jack Mayfield. The freshman has made just three starts with 13 relief outings, but he has one of the pitching staff’s three complete games this year. 7 & 5…Wins and saves by Jeremy Erben, who leads the Sooners with 31 appearances, including 29 in relief. Erben’s saves are second to Ryan Duke, who leads the team with 11. 540…Miles from OU’s campus in Norman, OK to Omaha, NE. The number has been posted in the Sooner’s dugout all season. ANALYSIS: Oklahoma took a page out of Virginia’s own book when it went on the road to beat the Cavs in last week’s Super Regional (as UVA did last year at Ole Miss). The first round match-up vs. South Carolina’s Blake Cooper (see below) is an intriguing one. Despite the big offensive numbers the Sooners have put-up this year they were shutout twice and scored just three runs in three games against the best pitchers they’ve seen so far: Texas. 9…College World Series appearances by the Gamecocks. Their last appearance was in 2004. 3…Times (including this year) that South Carolina made it to Omaha in the same year as intrastate rival Clemson. The two also appeared together at the CWS in 2002 and 1977. 2-0…South Carolina’s record vs. Clemson at the ’02 CWS – the only games between the two teams in Omaha. 12…Home runs hit and stolen bases by Whit Merrifield. The junior leads his team in both categories and he’s the only Gamecock with double digit home runs and stolen bases. 13 & 70…Sacrifice bunts and runs scored by Merrifield - both tops in the SEC. 9…South Carolina players who have hit at least seven home runs and driven-in at least 28 runs in 2010. 15 & 52…Team leading doubles and RBIs by Adrian Morales. The junior is batting .286. .371…Team high batting average of Jackie Bradley, Jr., who had 51 RBIs entering the CWS. 12 & 118 1/3…Wins and innings pitched by Gamecock ace Blake Cooper, who leads the SEC in both departments. The senior (12-1, 2.81 ERA) suffered his only loss of the season in his last start of the regular season to SEC regular season champion Florida. 4…Complete games pitched by the SC pitching staff – the most of the eight CWS teams. Sam Dyson (5-5, 4.39 ERA) has tossed three of them, while Cooper has the other. 91…Combined relief appearances by Michael Roth (1-1, 1.50, 3 SV), Matt Price (3-1, 2.54, 10 SV) and Jose Mata (7-1, 2.34). Roth is second in the SEC with 33 appearances, while Mata’s 31 are tied for third. 568…Strikeouts by the Gamecock pitching staff. The total ranks third in the nation and is second only to UCLA’s 619 of the teams in Omaha. ANALYSIS: Like SEC rival Florida, South Carolina is a team that lacks a lot of flash, but just gets it done. Cooper is a bulldog who has gone up against the top pitchers in the SEC and lost just once all season. While none of the other starters approach his production, the bullpen is deep enough to make the Gamecocks a legit threat. Their Sunday match-up with OU could be the best of the four first round games.